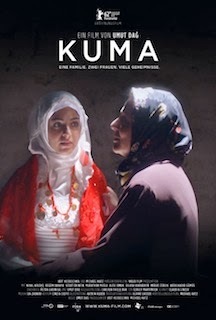 Movie Review: “Kuma” showcases the life of a firmly integrated Turkish family, where marriage, love, and motherhood, end up in false hopes, disagreement, and deception. The story begins with the wedding of Ayse (Begum Akkaya), a meek 19-year-old country girl, and Hasan, who lives in Vienna with his family. The uncomfortable atmosphere surrounding the wedding, especially among Hasan’s sisters, lets us foreseen that something is wrong. In fact, Ayse is on her way to Austria to be the second wife of Hasan’s father, in a scheme arranged by Fatma (Nihal Koldas), family’s matriarch who was diagnosed with cancer and wanted a substitute to take care of her husband and children. When her death was expected at any moment, the plot gives a big turn in multiple fronts, striking us with its shocking effects. The film was superbly shot and keenly photographed, whereas the dashing direction by debutant filmmaker Umut Dag, gave excellent indications for the future. The notion of women’s duty is very present, as well as the bitterness of a society that opts to close the eyes to domestic violence or homosexuality, instead of facing it. The final half hour was very expressive in letting come out pain, shame, and constraint. “Kuma” revealed to be a beautiful, biting, and overwhelming film, with so much going on at the same time, yet organized and structured in a very compelling way. Actresses’ fantastic performances also deserve mention.